There’s a new Linux box at my house, and it’s connected to the TV set. It’s a Moxi. I’ve not spent a ton of time with it yet, but so far I’m liking it. The main reason I never bought a Tivo was because I didn’t want to have to buy a device and then pay each month for service. So the Moxi is owned by my cable company (just like my cable modem is) and I’m just renting it. It’s a trade off I guess, but it’s one I’m comfortable with right now. I’m excited to see what sort of tricks the Moxi has up it’s firmware. I suppose the Moxi FAQ and Moxi Tips will be quite useful. Oh, there’s also a bit on PVRblog about Moxi, and Engadget has Moxi stories too, and I’m sure much more… Isn’t the intraweb great? Posted on Tuesday, April 26th, 2005 at 11:30 am. Subscribe to the comments feed. Both comments and pings are currently closed. Post on your own blog. I just went from Tivo to Moxi back to Tivo all in the space of a week. I will be honest I think Tivo was a better deal. you could “watch and pause” two different channels at once. 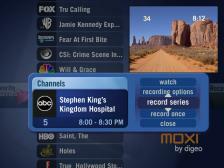 With the Moxi box you could only pause and watch one channel Tivo allows you to buffer two channels at once. As for the Fee with the right package at DTV they wave the Fee. I also missed the Grid system for looking at what was coming on. Once again YMMV. But I thought I would give you my opinion for what its worth lol.